Blue Ridge Grace Brethren Church (Winchester, Va.) voted on May 20, 2018, to extend a call to Davey Ermold to be their pastor. Having served as a lay leader at Grace Brethren Church of Calvert County, Owings, Md. (Dario Agnolutto, pastor) for the past nine years, Davey and his wife, Laura, are excited to transition to ministry on the other side of the nation’s capital. Laura has been an elementary school teacher at Grace Brethren Christian School (Clinton, Md.) for ten years; however, Lord willing, they plan on homeschooling their four children: Daniel (7), Micah (5), Rebekah (3), and Naomi (1). 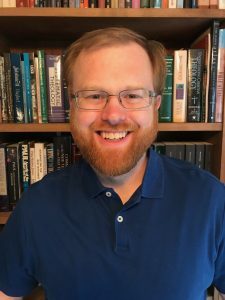 Davey is a graduate of Cairn University (B.S., Biblical Studies; B.Mus., Performance) and Lancaster Bible College | Capital Seminary and Graduate School (Th.M., Theology). Davey and Laura would welcome prayers as they transition to a new city and ministry, and they warmly invite anyone visiting the Winchester are to come to worship the Lord and study the Word with the saints there. He begins at the church on July 2.